what is the live fund? The Viburnum Live Fund is a $20,000 Fund partnered between UWA SMIF and Viburnum Funds. Named the SMIF-Viburnum 'High Conviction Fund' the portfolio is run purely by the SMIF Investment Team as a practical way to engage with the stock market using real money. This has proven to be an invaluable learning opportunity, with regular meetings with industry professionals where students have been able to pitch and communicate investment ideas to contribute to the fund. We host regular sundowners to update members with the progress of the live fund, providing an excellent opportunity to meet the committee and learn the reasoning behind our positions. Students are the main beneficiaries of the groundbreaking partnership. Established as an extension and complement to the theoretical education students gain through their degree, this opportunity to manage a portfolio of money is a unique advantage of the UWA Business School. With regards to financial profits made through the fund, a portion is directed towards charitable, socially positive organisations. The Live Fund was officially launched on the 21st of April, 2015 with the presence of UWA SMIF, Vibrunum Funds at the UWA Business School. An exclusive event for SMIF members, the new partnership between SMIF and Viburnum is an Australian first. It will allow UWA students to set a new benchmark by investing and contributing to a live fund. 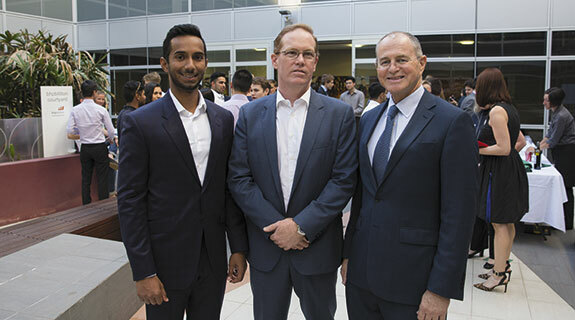 Canapés and a selection of wines were shared between students and the executives of both organisations to celebrate the launch of the endeavour. The event also contained an initial partnership launch presentation and partnership signings.